Flash! Friday Vol 2 – 3: WINNERS! 10-9-8-7-6-5-4-3-2…. JUST KIDDING! Can’t say that last digit as it’s not New Year’s Eve yet (not even for our bold Aussies!). It’s another full week here at Flash! Friday, with our winner’s interview posting hopefully Tuesday, and our regular contest on Friday–the first one of 2014, if you can believe it; which, since we kicked off in December 2012, makes me feel reeeeally old. Also going up on the FF site in the next two days is my story contribution to accompany Composers for Relief, a fundraising effort to support the victims of November’s Typhoon Yolanda. This companion e-book will be published in January, with 100% of the proceeds going to the charity organization. Your support is gratefully appreciated! 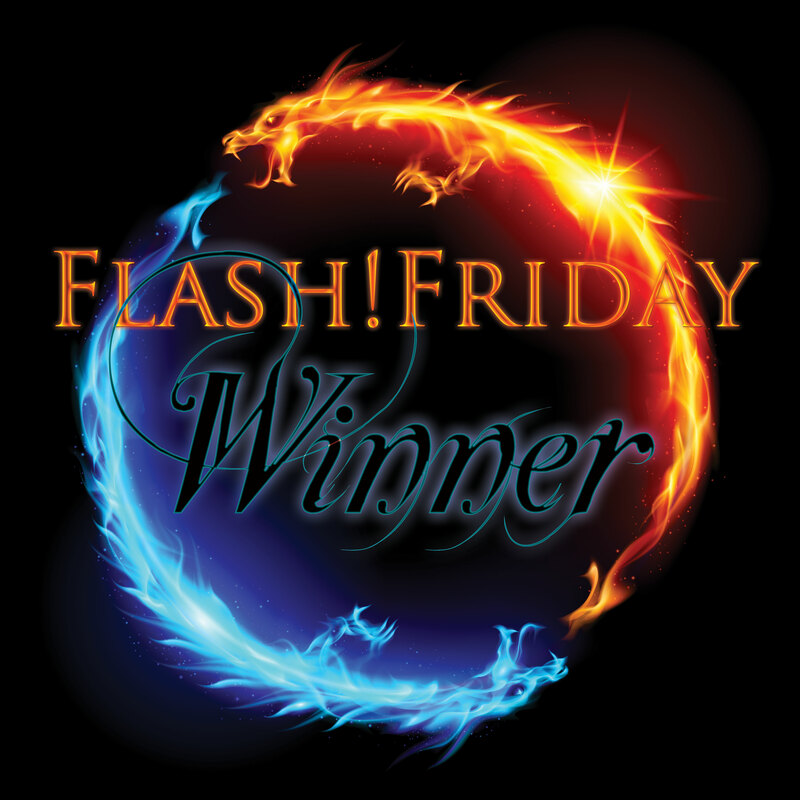 She says: So here we are, the last Flash Friday Fiction contest of 2013! I’m so grateful for being given the opportunity to judge it! I must admit this was a challenge for me, so many wonderful entries this week; putting together my finalist list I felt like a kid in a candy store being pulled by my Mother as I screamed hysterically, “Can’t I just have one more?” I won’t lie: it was really difficult to decide, but I guess that is the hallmark of an excellent and vibrant writing community like this one. Thank you to everyone who took the time to enter their work this week and to those who came along to read. This close to Christmas it can be hard to get time to write, so the effort is appreciated. Before I get to the winners, I would just like to make a special shout out for Amy Wood‘s “In Silence I Wait.” When she mentioned that her Mother had exclaimed this weeks’ prompt looked like a Dragon’s eye I was immediately transmitted to that scene in JurassicPark where the terrifying T-Rex is peering through the van window, excellent interpretation of the prompt! I’d also like to make a shout out for Chris White‘s “There Wasn’t Much Room for Hope,” mainly for the excellent use of pacing and paragraph structure that works so sublimely well. This felt like the start to a larger story that I would be itching to read more of. Karl A. Russell, “Attempt # 408?”. I really loved this piece, a blend of sci-fi and fantasy, the choice of words easily created a very visually detailed and intricate little scientific world and workshop; “splintered roofbeams (#360, #387) each with their own numbered casual connections. The addition of the tiny protective daughter “Hope” was utterly adorable. I now really want to own a “flask of tiny, swirling stars”. Adrian George Nicolae, “Talks.” Through only one side of a conversation, Adrian had me in stitches with this one; I love the dismissing, judgemental and cheeky tone of the main character. I also love the idea of a bumbling creator who has caused his people to stop believing he ever existed through his sheer incompetence. The line; “yours will sulk without a reason” is such a perfect and condemning way to describe the nature of the human condition. A J Walker, “Patricia.” I have to praise the skilful use of language throughout this piece; the relationship between the telescope, the viewer and the vast expanse of space is beautifully captured through lines such as: “speckled dance of life and death played out above him on an enveloping black sheet.” Really well imagined and a nice use of the prompt, especially the notion of hope. Dieter Rogiers, “Wouldn’t It Be Nice.” Excellent piece of world-building in such a small word count, with the addition of a great title which had me humming that song all morning. (I’m a sucker for a good title!) It is made obvious that our character has watched his home and all he has ever loved burn; a home connected to our own through object reference such as the LPs and candy floss; human kind now appear to be floating aimlessly through space, devoid of hope. Yet our character does not dwell on this destruction. Instead the story is willing us towards optimism, towards new beginnings: the start of a new song, which this time will probably be far from the sounds of the Beach Boys. This piece ties in particularly well with the prompt too, it had me hoping they find a new home, well done! Joidianne4eva, “We Will Light the Heavens.” I loved the poetic style of this piece; it was both stunning and glorious. I like the idea of space pressing in from all sides; that the void can be so purely dark, that its sheer nothingness has its own oppressive presence. I’m a huge fan of great endings and the line “Alone they were nothing but soon they would be a star,” is the perfect endings for this piece. Clearly this line extends the story beyond the nature of mere stardust to encompass mankind. Together, through collective bravery we can accomplish the greatest things, things far beyond our individual imaginings. That is what this story tells, through poetry, stellar motions and song. Beautifully done! The central premise of this piece is so powerful: Christa stayed behind to experience what it is to be engulfed by a black hole, not for any suicidal notion, but merely for the sake of curiosity, to experience the unknown. There is also a political theme here too. The poor, the ill and the crazy have all been left behind to die, presumably because the rich have abandoned them, their wealth providing them opportunity to flee. The approach of the black hole being signaled only by the extinction of the stars is really effective; its consumptive power can only at this point be perceived through tiny incremental acts. I also love the use of the world “cartwheeled” to describe Christa’s movement into the singularity; it’s so playful, reflecting her nature. I also appreciated the use of the word “unborn” to describe the sensation, something we can articulate but not truly experience and therefore understand. The end for me was a fantastic surprise; I had imagined Christa being locked in the singularity forever, infinitely extended beyond herself; instead she bursts through it to be born again as a new light, a bright star heralding new hope. A highly deserving winning piece. Congratulations! Congratulations, Rebecca! Your winner’s badge waits most excitedly for you below. Here is your winner’s page and your winning tale on the winners’ wall. Please contact me here asap so I can interview you for Wednesday’s #SixtySeconds feature, which this week will (I think) post Tuesday. Woooohooo! Congratulations to all, judging was hard this week, so many fantastic entries! Until next time, have a Jovial Birthday.